I just had to post this photo from our trip this weekend for our friend WTokie. He recently posted a photo about Double Cola. I had never heard of it. 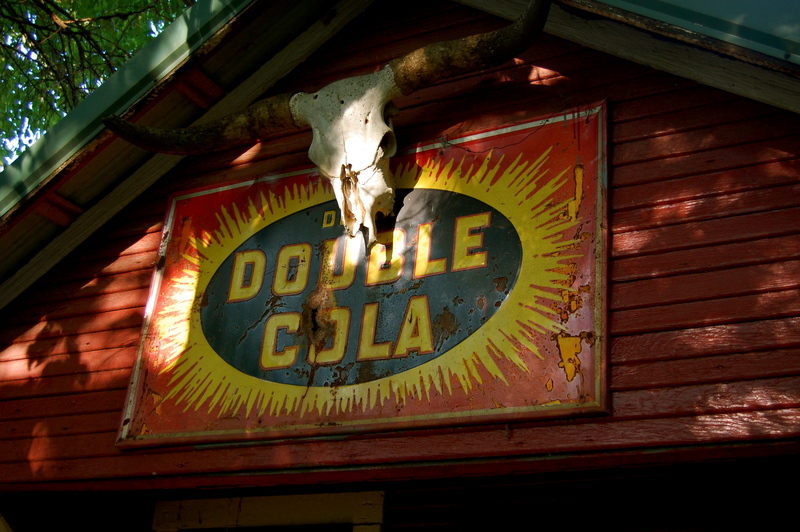 This morning when Nate and I walked outside at Chock and Kelly’s (our hosts for the weekend) — we saw a sign for Double Cola on the front of their bunkhouse. — Happy Trails. Oh Misti, what pictures! I had tears during the ceremony but tonight while I relived those wonderful memories through your lens…..I just bawled. Praise the Lord you’re taking the time to do this again. You and Nathan don’t have to say a word I already know you both are too busy for this….but you have such a natural talent/eye for photography, please, use God’s gift as often as feasible. I don’t get to see you as I would like, but that is my fault because I am the older one. When I talked to your mother tonight on the phone I shared with her you are more beautiful than ever. Misti, you glow with inner radiance. I am very proud of you. P.S. I would still like to give you two a tour of the old house next time you come in if time permits. If not I will just meet you wherever you are going to “stay” for tea/coffee and cookies. I will bring the goodies–plus, the box of photos. Thanks Paula — We definitely hope to visit soon. I want to bring my scanner and get those pictures!